As time allows, I'll post some of my favorite tapes here. Hope you enjoy them. Here's a nice album in the chanson moderne style by singer Ghita ben Abdeslam. Born into an artistic family, Ghita is the niece of sibling singers Mohammed al-Idrissi and the celebrated Bahija Idris, and daughter of composer Mohammed ben Abdeslam, who composed the songs on this album. Ghita composed lyrics to her own songs later in her career, some in Moroccan, and some in straight-up Egyptian. She retired from performing at a young age (1999 according to her Wikipedia entry), but reportedly promised that she would return one day. Thanks to Marc of Hive Mind Records for hooking me up with this tape. Moroccan music fans should definitely be keeping an eye on what's new at Hive Mind - a great source for Moroccan music recordings over the last couple of years. More to come on that front very soon!! 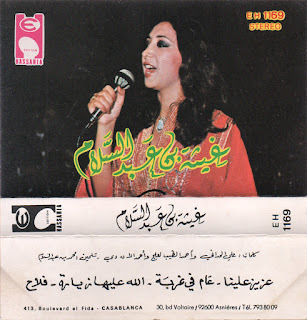 This blog features music from Moroccan cassettes that is, to the best of my knowledge, not available outside of Morocco. It is shared here to spread the appreciation of Moroccan music and artists. If you are an artist who would like your music removed, click below to contact me.